“Israel launched a major military operation in Gaza on 8 July, with the stated aim of stopping militants firing rockets and mortars at its territory. Indeed, a mortar fired from the Gaza Strip did hit the Eshkol area on September 16th – as the BBC was aware but did not report separately at the time. Obviously a ceasefire cannot be accurately described as having “so far held” when mortar fire has taken place. 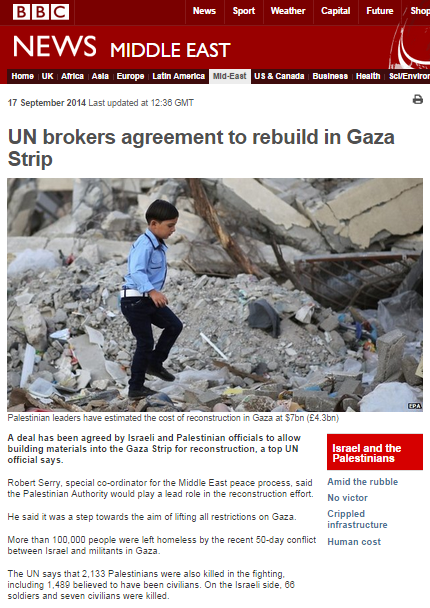 The BBC’s description of the actual subject matter of this report’s headline – an “agreement” on reconstruction in the Gaza Strip – is very vague and provides little factual information. Mr Serry announced that his office had brokered an agreement to enable large-scale reconstruction, involving the private sector in Gaza and giving a “lead role” to the Palestinian Authority, “while providing security assurances through UN monitoring that these materials will not be diverted from their entirely civilian purpose”. Whilst the lack of information concerning the actual details of the agreement is not the fault of the BBC (the UN has not publicised exactly how it intends the agreement to work), it would nevertheless have been in order to clarify several issues to BBC audiences. One important point is that from the information available this agreement does not appear to be very different from previous arrangements beginning in 2010 whereby construction materials were imported into the Gaza Strip for projects guaranteed and supervised by the PA and international bodies. Despite those guarantees and that supervision, Hamas managed to misappropriate construction materials for the building of dozens of cross-border attack tunnels and other military projects. The question of how “security assurances through UN monitoring” will be any more effective this time round than, for example, its past inability to prevent missiles being stored in UN schools did not apparently prompt the writer of this article to summon enough journalistic curiosity to chase up Robert Serry’s office. Instead BBC audiences have to make do with a rehashed version of ambiguous statements from a UN press release. “Mr Serry added that the UN stood ready to provide “increased technical assistance” to the Palestinian unity government, which was formed in June by the Fatah movement of PA President Mahmoud Abbas and Hamas, the militant Islamist group that dominates Gaza. With Hamas having sidelined the PUG into irrelevance by continuing to run its own de-facto government in the Gaza Strip throughout the conflict and with details of a Hamas plot to overthrow the PA having emerged in recent weeks, the question of whether the PA can realistically be expected to oversee reconstruction in the Gaza Strip in a manner which will prevent Hamas from getting its hands on building materials is a very relevant one which the BBC elects not to examine. Clearly those assurances have not been met and yet – despite its platitudes at the time – the UN is now doing deals with the same body which blatantly ignored existing agreements and, moreover, appointing it to a “lead role” in a reconstruction project which, if not stringently monitored, could well create the spark for further rounds of conflict. An organization truly committed to the public purpose of building “a global understanding of international issues” would of course ensure that audiences were made aware of the above issues.